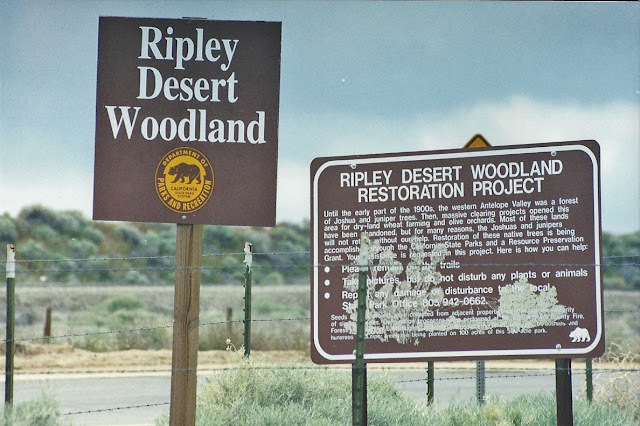 For those of you who have been to the Antelope Valley Poppy Reserve, Arthur B. Ripley Desert Woodland SP is pretty close by, only about 7 miles due west of the reserve on Lancaster Rd. 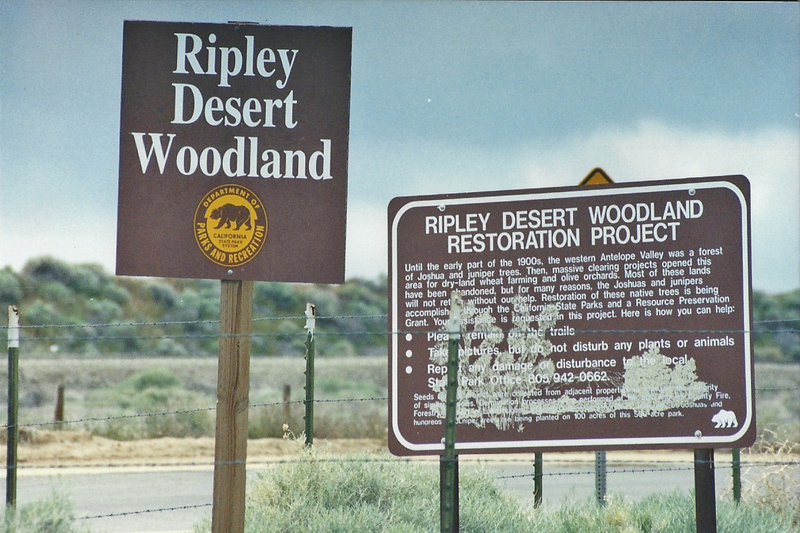 The property was donated to the State in 1988 by Arthur "Archie" Ripley, preserving a remnant of the once abundant Joshua Tree/Juniper woodlands, which had been decimated over the past several decades for farms and housing developments. We visited this area in May of 2003 - a bit late for wildflowers, but we did come across some Desert Purple Sage (Salvia dorrii) and Scarlet Buglar (Penstemon centranthifolius). There's an easy self-guided nature trail in the park, a picnic table, and a pit toilet. Except for the shotgun shells and trash heap we came across here in 2003, a great place for a day trip to the high desert. 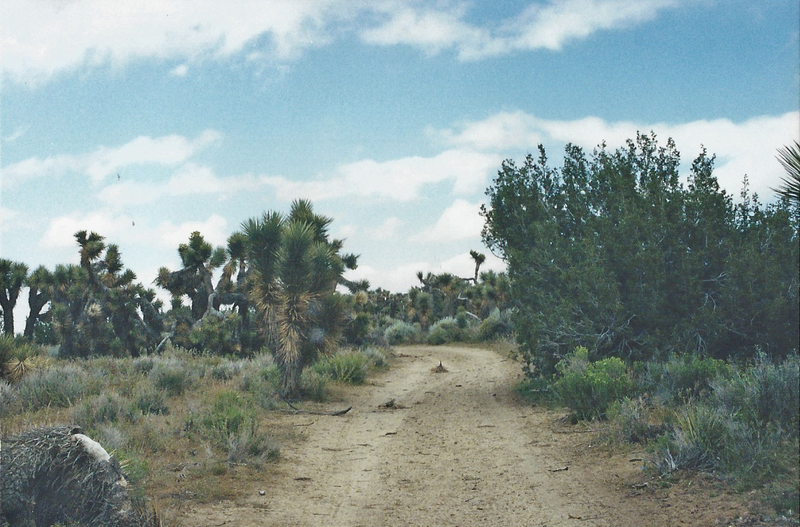 5/4/03 Arthur B. Ripley Desert Woodland SP. 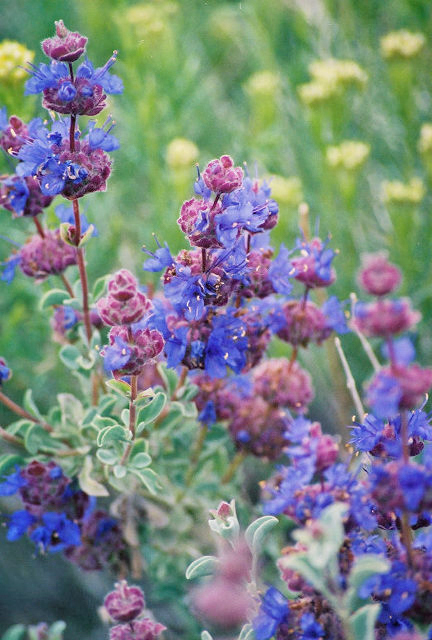 5/4/03 Desert Purple Sage (Salvia dorrii). Arthur B. Ripley Desert Woodland SP. 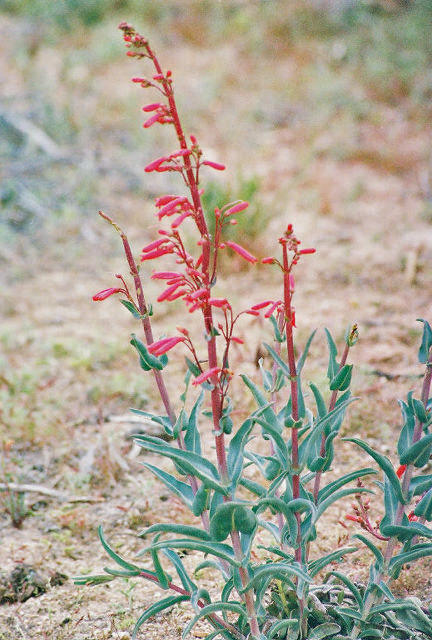 5/4/03 Scarlet Buglar (Penstemon centranthifolius). Arthur B. Ripley Desert Woodland SP. Location: 7 miles west of the Antelope Valley Poppy Reserve on Lancaster Rd. (an extension of W. Avenue I) at 210th St.
County/State: N. Los Angeles County, CA. Directions: From Hwy. 138W, exit 210th St. West. Travel 1 mile south/left to the park (or enter from Lancaster Rd. - dirt track at signed park boundary at (GPS for entry point at turnoff on Lancaster Rd: N 34 degrees 44' 46.7" / W 118 degrees 29' 0.24"). Park on Lancaster Road and enter through pedestrian walk-thru by the gate. Contact Info: Park office (661)946-6092. Road Conditions (as of May 2003): Narrow, unpaved, somewhat hard-pack/sandy road. 4WD recommended, but passable to passenger vehicle. Several off-road tracks branch off from here. Track from Lancaster Rd. runs parallel to park boundary, which is fenced off (not sure if there's a main gate or entrance elsewhere). A left turn about 3/4 mile up appears to turn into park grounds. NOTE: numerous shotgun shells and dumpsite at this junctions (a mattress, old refrigerator, etc.). Trails: Easy (no elevation gain), short, self-guided nature trail. Amenities: a picnic table and pit toilet. Pets: Ok on a leash. Flora & Fauna (what we saw): Desert Purple sage (Salvia dorrii), Scarlet Buglar (Penstemon centranthifolius), Fiddleneck (Amsinckia spp. ), Goldfields, Chia, Mustard, Dove Lupine, Filaree, Desert Primrose, Blue Dicks.